Eagle Sentry can design a home theater experience to fit any budget. 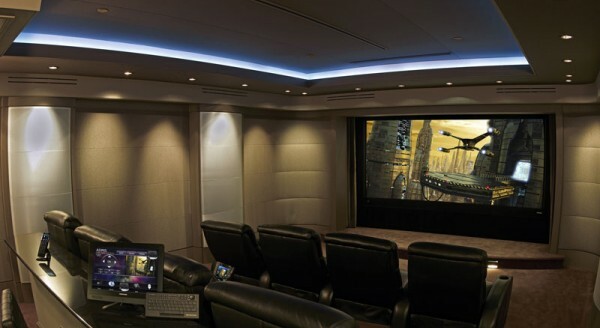 Feel the excitement of watching a movie in the ultimate comfort of your private home theater. With the push of a button, the lights will dim and the projector will emerge from the ceiling or wall. Get into the moment of high-impact movies by feeling the floor vibrate underneath your seat as huge explosions occur during the scene. You'll feel like you're on location as sound travels from one side of the theater to the other. Eagle Sentry can transform your family room in to a muli-purpose media center. You can watch a movie, enjoy video gaming with the family or visit your favorite social media site. Let us help you design the family room around your way of life. Take it a step further and compliment the yard with quality speakers disguised as beautiful landscaping rocks. Television plays a huge role in today's lifestyle. Experience entertainment from your DVD player, cable box, satellite receiver and iPod everywhere in the house. This can be accomplished with only one set of common components. Each video device can be distributed and simultaneously viewed. Best of all, you can control all your sources by simply using a remote control, wall mounted keypad, touch panel or PDA.